See a Red Sox game in Boston—easy, hop in your car, drive to Boston via high-speed roads, see the game, and return home the same day. See a Broadway show; visit family in Arizona; experience springtime in Paris—easy, surf the web to find the best airfare, pack a bag and you’re off. Such ease of travel is quite recent. Before train service came to Scarborough in the 1840s, travel was by shanks’ mare, boat, horseback or stagecoach. In the 1600s walking from Scarborough to Portland could take two days via a circuitous dry-land route. Because of Scarborough’s unique geography consisting of marsh and rivers, it was often quicker to travel from Dunstan to Black Point via boat. Travel of any distance was usually via boat or horseback. 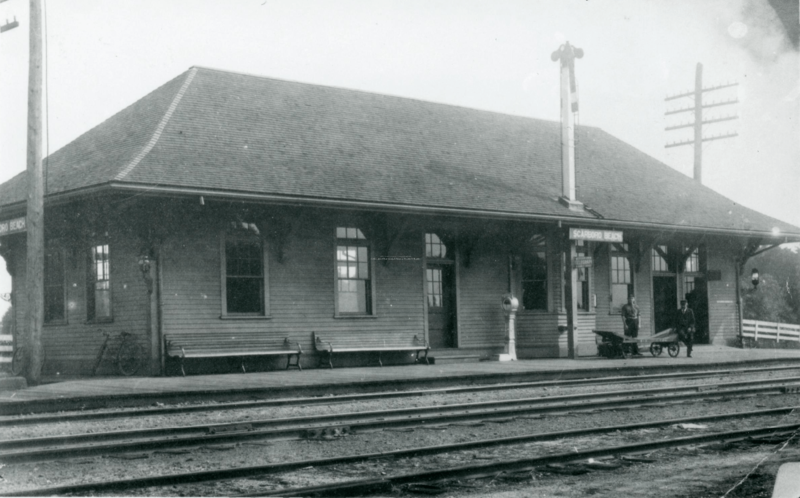 The arrival of the train, and later the trolley, allowed residents greater flexibility of travel, opened up greater trade opportunities, and made it possible to seek employment outside of Scarborough. The train, trolley and the automobile also brought tourists to Scarborough and a new industry that created jobs for residents. For a short period, Scarborough was part of the new age of aviation and had its own airport, yet another means of travel that increased opportunities and mobility for residents. The airport is no longer in Scarborough, but it is close by and easy to reach via automobile. 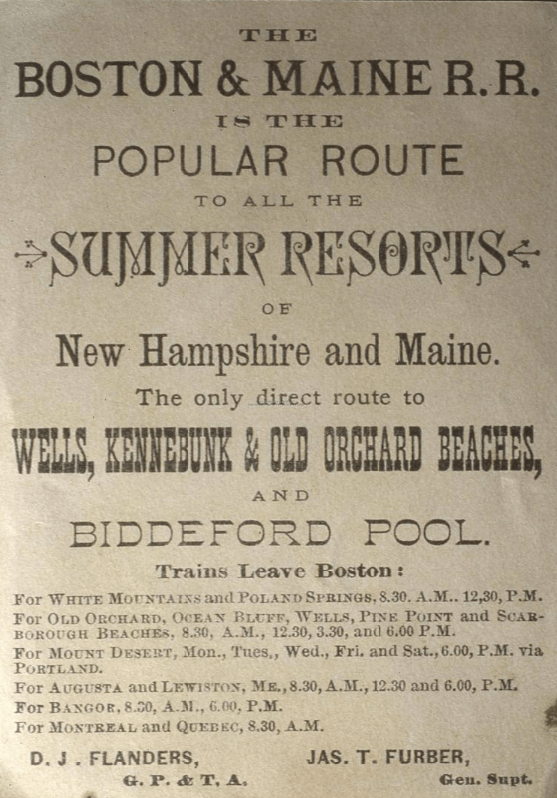 Before the Portland, Saco & Portsmouth Railroad began operations in 1842, people walked, rode horseback or traveled by boat or stagecoach. The railroad company, a wholly owned subsidiary of the Eastern Railroad, was the first link between Portland and Boston and points south. 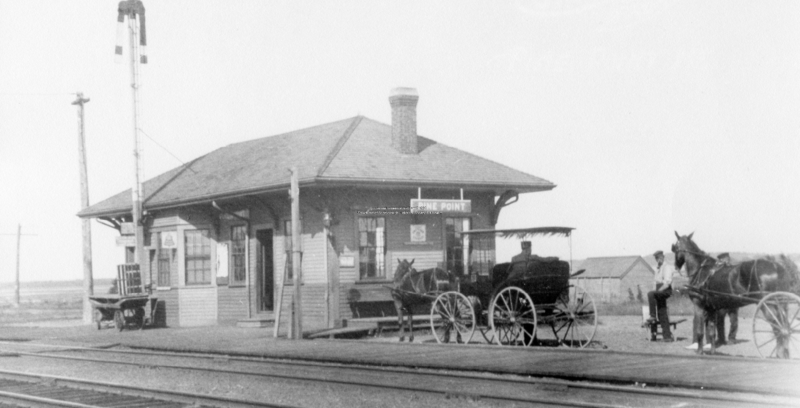 The train traveled from Portland stopping at stations in Scarborough and other towns on its way to South Berwick where it connected with the Boston & Maine. 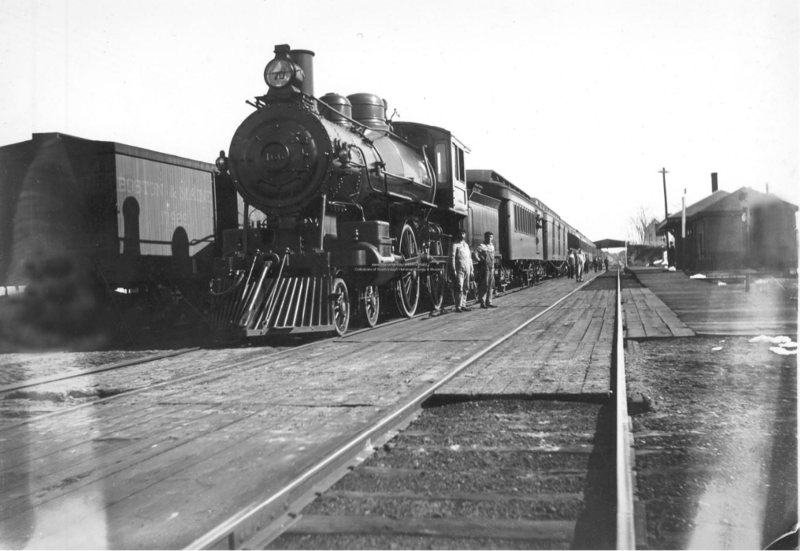 With the train came increased opportunities for trade, jobs, and travel. Completion in 1853 of the Grand Trunk Railroad linking Portland to Montreal expanded even further opportunities for trade and jobs. Also, Canadian tourists no longer had to endure long carriage trips to visit Scarborough beaches. By the 1870s, sixty-five trains a day brought passengers and freight in and out of Portland, many through Scarborough. In 1935 with revenues dropping, the Maine Central and the Boston & Maine railroads bought the first streamliner east of the Mississippi, the famed Flying Yankee. The novelty wore off and revenues continued to drop. In 1947, the Boston & Maine and Maine Central purchased 20 new cars, the latest in passenger equipment, but potential passengers were turning to air and automobile travel. Other attempts to remain solvent failed, such as eliminating certain stations and not buying other divisions. By 1959, rail freight revenues were sufficient enough to offset losses in passenger numbers and passenger service was terminated. Passenger service was reinstituted recently with the advent of Amtrak’s Downeaster service between Boston and Portland. The Boston & Maine still exists and its one remaining line accommodates both freight and Amtrak passenger service. The Portland, Saco & Portsmouth is long gone and its rail bed is now part of the Eastern Trail. 5.Frank Hodgdon, “The Way It Was,” American Journal, 8 November 1995. 6.Susan Dudley Gold, ed., Scarborough at 350: Linking the Past to the Present (Scarborough, ME: Friends of the Scarborough 350th, 2007), 98. This entry was posted in Black Point, Blue Point, Dunstan, Higgins Beach, Oak Hill, Pine Point, Prout's Neck, Scarborough Beach and tagged Amtrak Downeaster, Boston & Maine Railroad, Eastern Trail, Portland - Saco & Portsmouth Railroad. Bookmark the permalink.